One hundred years ago, an airplane took off from the Harvey Baseball Park and crash-landed in a newly plowed field about a half-mile down river. It was all over in less than a minute but photographer William Douglas needed only fractions of a second to capture the historic event. 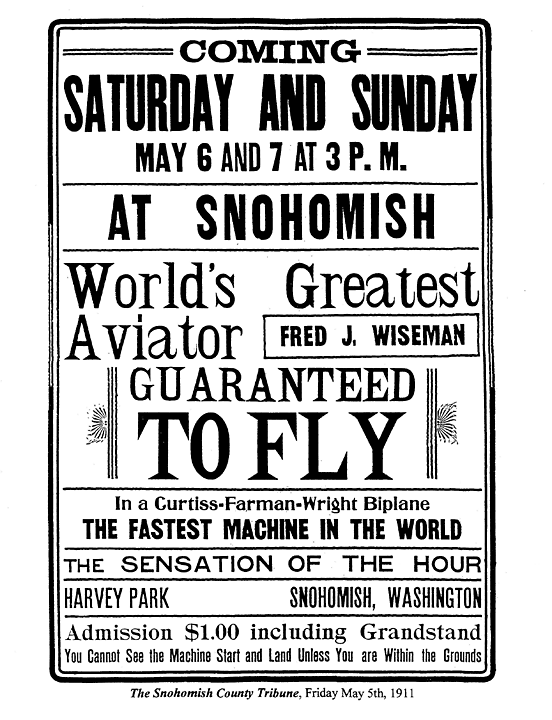 Fred J. Wiseman, a former racecar driver from California, was billed as the “World’s Greatest Aviator,” and the Curtiss-Farman-Wright biplane as “The Fastest Machine In The World” in the full-page ad published in the same issue. The plan was to take off at 3, Saturday afternoon, fly down the river a few miles, circle around the town and land back in Harvey Park. Fifteen to thirty thousand people were expected to attend over the weekend, according to the article, and special trains were added to run from Everett. David Dilgard, historian with the Everett Public Library, who has done extensive research on this event, writes: “While no suitable space for landings or takeoffs was found at Everett, the baseball grounds on the Harvey homestead across the river from Snohomish appeared to be workable.” The ballpark was located between the river and the railroad tracks, where today a seasonal market operates under the large billboard. The Great Northern Depot once stood in the area, which came in handy for the delivery of the disassembled plane that arrived by rail on Thursday, the fourth. Surprise! It rained most of the day Friday, slowing down the re-assembling of the aircraft, and the heavy rain continued well into Saturday morning, resulting in the cancellation of that day’s free exhibition. The rain stopped by Sunday afternoon, but barely 400 people had paid the $1 admission to enter the park. According to the May 17, 1911 issue of the Tribune, an estimated ten thousand people witnessed the flight from various vantage points for free. Trouble with the 80 horsepower Hall-Scott overhead-valve V-8 engine delayed the flight for an hour, but finally, Wiseman took his seat in the fragile biplane, parked at home plate, and the strongest crew member turned the eight foot long propeller to crank the unmuffled motor into action. 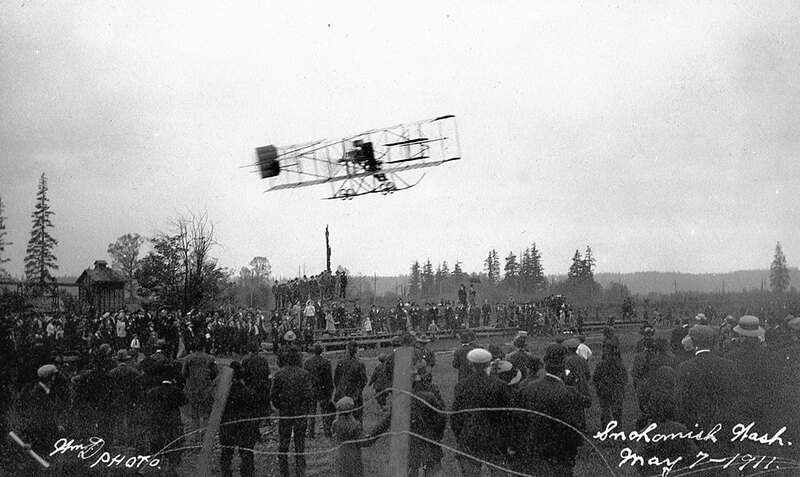 First Airplane Flight in Snohomish, May 7, 1911. 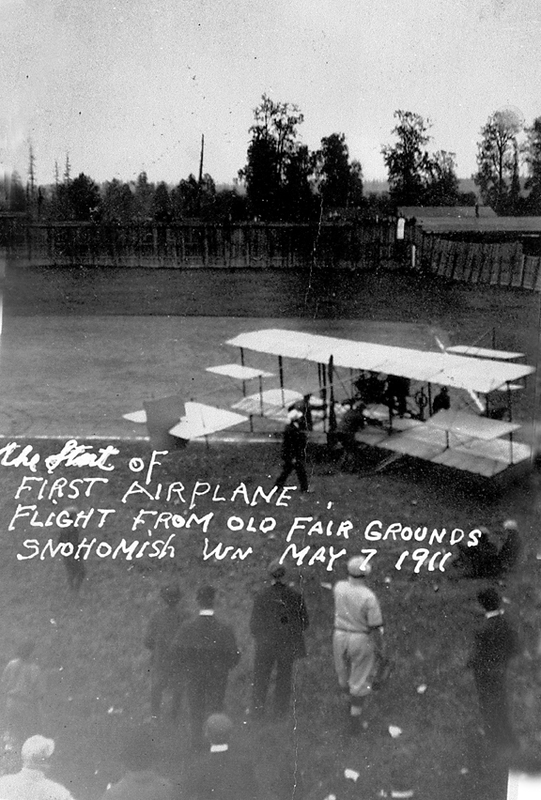 The photographer William Douglas came to Snohomish to capture the first airplane flight in Snohomish County, which he published as postcards. This view is the only one of the three surviving images that shows the plane in flight. Flight Location 2011. Historian David Dilgard’s research has identified the spot where Douglas stood to capture his historic image. Rather than stand in the blackberry bushes, however, the author gratefully acknowledges B & H Body Repair on Airport Way for allowing him to stand in the back of a pickup truck on their used car lot. 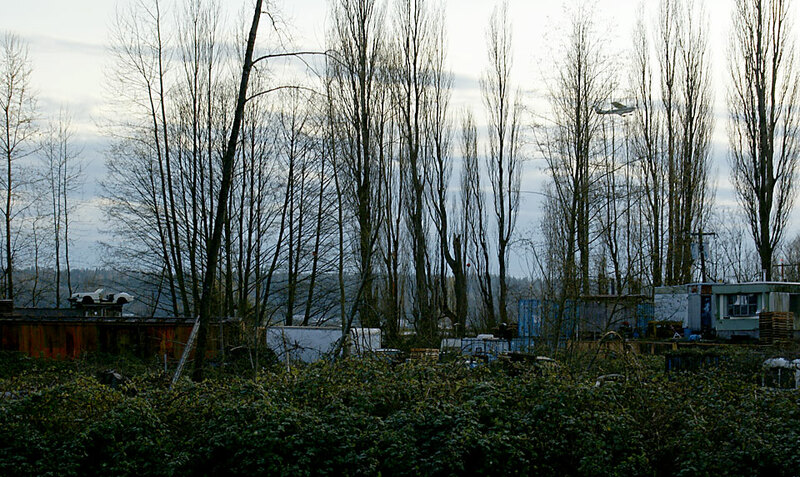 This entry was posted in Posts and tagged Fred Wiseman, Harvey Airfield, Snohomish WA history on April 18, 2011 by warner.